This is a checklist that I update and follow at the beginning of every year. 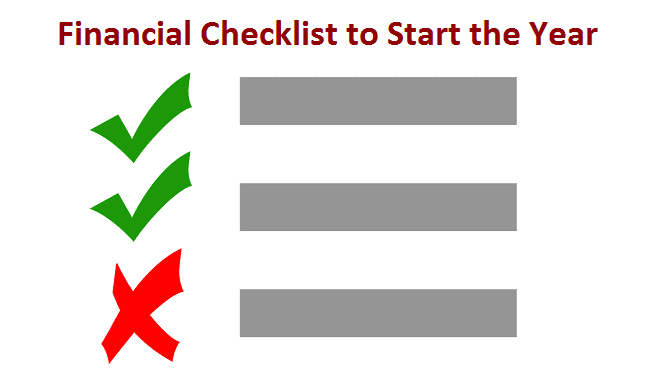 Similar to the end of the year tax tips, there are certain financial to-do items to start off the year on a strong note. Here is the checklist that I use at the beginning of the year. For 2018, TFSA’s get $5,500 in contribution room ($57,500 total since 2009). If you made a withdrawal in 2017, then this year, you can contribute up to $5,500 plus the 2017 withdrawal amount. For more details about your TFSA contribution room, here are the details. For those of you with kids, a new year means more government matching for your RESP! The federal government will match 20% of your RESP contribution which maxes out at $500 per child per year. To max out the government contribution, you’ll need to contribute $2,500 per child to the RESP account (how does an RESP work?). Haven’t opened an account yet? We have ours with TD e-series, but if we had a child today, I would likely open it with a brokerage that offers commission-free ETFs. Also, don’t worry if you haven’t started contributing yet, you can still catch up on your RESP contributions! Another contribution?! I know, by the end of January, our savings stockpile definitely takes a hit – but it’s worth it! Even though it’s no longer 2017, you can still contribute to your RRSP (or not) to your tax advantage. The RRSP contribution will act as a deduction, so if you have tax owing (ie. from capital gains or side business etc), or in a high tax bracket, it may make sense to make a contribution. RRSP contributions made between now and the RRSP deadline (March 1. 2018) can be claimed for either 2017 or 2018 tax year (or carried forward). If you have significant capital gains in a non-registered portfolio that requires re-balancing, then early in the year is the best time to do it. Why? Simply because capital gains tax is deferred for over a year – that is when you file 2018 taxes in late winter 2019. Also, now is a good a time as any to re-balance some of those holdings. Calculating your annual investment returns is important to see how effective your portfolio is against the index benchmark. This is really geared towards more active investors or those that rely on their bankers to choose active mutual funds for them. Some discount brokerages do the calculations for you, but I’m the type that likes to confirm with my own calculations. So if your broker doesn’t do the investment return calculations for you, or if you want to do them yourself, I recommend that you get familiar with the XIRR function in Excel (or google spreadsheets). Sounds complex, but it really isn’t too bad for those who have used a spreadsheet before. Here is a thorough explanation of how to use XIRR to calculate your investment returns. Print off interest statements from my investment loan. For more information, here is a comprehensive article about the information required to file income taxes. If you are a small business owner or own rental properties, here is an article that may help. Those are my checklist items to start the year. What tips do you have? Excellent list, thanks for keeping it top of mind! Let’s say I wanna contribute 15 000 to my rrsp for 2014 however im still in the first 60 days of the year. Would that be okay? or do I have to wait till after March 1 2014 to contribute for 2014? Hey Tyler, yes you can elect to claim the tax deduction either 2013 tax year or 2014 tax year. For me, I keep it simple by waiting until after the RRSP deadline to contribute for the next year. Actually, you can delay deducting your RRSP contribution as long as you want. As long as you have the contribution room, you can contribute and delay claiming the deduction. We find this useful when you don’t know exactly what your taxable income would be. For example, you can contribute a larger amount (assuming you have room) and then when you do your tax return, you can deduct the exact amount that brings your income to the bottom of your tax bracket. Delay deducting the rest until the next year. This strategy gets you the maximum possible refund for your contribution. Another subtlety to keep in mind is you can over-contribute by $2000 without being penalized. So Tyler can contribute $15000 even if he only has $13000 in contribution room. Be careful to keep good track of your contribution room if you do this though :). Hey FT, what’s stopping you from moving your RESP from TD e-series to another discount brokerage. Is it the transfer fee? I have been thinking of doing the same but BMO Investorline requires 25K min before waiving annual admin fees and I’m not quite there yet. For 2015, 1, 2, and 5 are now complete! Thanks for providing the link about being able to determine your TFSA contribution room for 2015. I have been busy completing number 4 on your list and this information will come in handy. Good luck throughout 2015 and keep the great content coming! Don’t forget to check all your insurance needs, they may have changed. Also a good time to ask for lower premiums! Great Tips! I love the TFSA room and can’t wait to get some of tax back. Just noticed on point #5, isn’t it a T4 that you get from your employer, not a T5? If memory serves, I believe T5’s are for interest income. Good eye Todd, fixed – Thanks! In the comments section date stamp next to some names lag by year or more. e.g @This Life On Purpose @Tyler Tran @ Frugal Trader @Todd @Be Smart rich. Last comment from @Todd and its reply @Frugal Trader seem to have correct date stamp. I believe this article is being reused and just updated with the year and any relevant changes from the previous. My comment found here was indeed from last year. BadCaleb is correct. This article was originally published a couple years ago, but I’ve updated it so that it’s accurate for 2016.
ok. These old comments are misleading as contribution limits and other information has changed. You could have tried to just copy/paste the article and modified it for 2016 leaving out old comments. A new year is always an excellent time to start things fresh – especially financial things. It’s usually the case that if you can do January right financially, your entire year will go well financially. How about plan now to avoid a large income refund when you file your 2016 taxes. you can apply for a reduction of tax at source by using the form T1213. Getting a large refund sounds good but in reality you are hurting yourself. you are giving the government an interest free loan for 12 months. 2016 started with down markets, if this trend continues, would it be wise to offload existing equities and buy when there is an evident trough? What about the tax implications on the capital gains? I would also add that it’s time to create savings goals and a fresh budget for 2016. This is one of my favourite activities, I am a bit of a nerd with this. We have just opened our RESP for our baby and we went with a low cost brokerage account. We are due with our second baby in the early spring so will be doubling up! Hi FT I was hoping you could help out with RESPs with the TD eseries funds, I was hoping you could explain how you rebalance every year if you make one lump sum contribution each year? Thank you. I try to keep it pretty simple. I make a $2500 deposit to each RESP account directly into the TD money market fund. For most, I would recommend to redistribute into their desired asset allocation. For me personally, I try to keep 75% equities and 25% cash/bonds. In the equities portion, I keep 25% Canada, 25% US, 25% international. If they fall out of balance, then I move money into the fund that is falling behind (ie. less than 25%). I have never sold a fund to rebalance (ie. greater than 25%), I simply rebalance the fund that is falling behind with new money. I think is so important to start fresh and very organized financially for the new year. I know next year I will be using this as a checklist to make sure I have everything in the right place at the right time. Thank you for the post! Since we are talking about income tax, we should also gather our public transportation cost for up until July of 2017. This year will be the last year we are able to claim the public transportation cost. If you had made donations during the year, collecting those receipts to organize for your tax filing will help too. Great list and reminders! Happy 2018! I have already done the TFSA and the RESP contribution, I almost forgot about the TFSA until a few days ago. We are with TD e-series as well for the RESP. Excellent list. For the rate of return, I recommend you evaluate it since the start of your portfolio rather than just the last 12 months. when starting with ETF portfolio for the very first time, how much one should plan to set the size of portfolio at? For example $10000, $25000? I would say go with a commission free ETF brokerage with as much as you can save . I don’t think there is a min number to start an ETF portfolio these days with free ETF trades.